Regardless of age or skill level, no one is drown-proof. 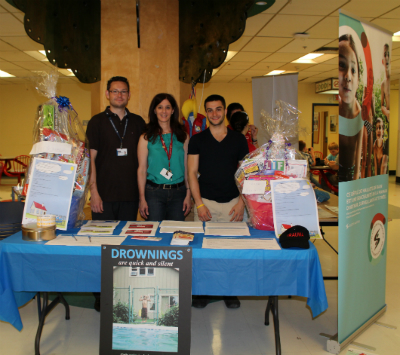 Each year in Canada, approximately 60 children aged 14 and under drown, while another 140 are hospitalized for near-drowning events. Our Trauma specialists, along with the Société de sauvetage were on site yesterday to remind patients, parents, and staff about this very important message. Properly fit young children with personal floatation devices. This also applies to older children who are non-swimmers. Floatation devices should NEVER be used as a substitute for adult supervision. Make sure children swim in an area for which they have the appropriate skill. Encourage your children and teens to take swimming lessons to improve their swimming skills even after the summer season is over. Drowning prevention requires a multi-faceted approach for different ages , skill level, and venues.There are also countless other measures you can take to ensure your residential pool is secure, and that kids are safe during diving, boating and water park activities. Visit our website for more information and spread the message.